When the FDA issued its ENDS deeming regulations in 2016, the agency brought ENDS products under the same regulatory umbrella as other tobacco products. Unless someone successfully challenges the FDA’s legal right to regulate ENDS systems under the provisions of the Family Smoking Prevention and Tobacco Control Act of 2009, manufacturers and retailers of ENDS products must now abide by the same regulations as makers and sellers of tobacco products. As you’re likely aware, the FDA deeming regulations of 2016 stipulated that all makers of ENDS products needed to submit PMTA applications by August 8, 2018 to continue marketing those products. In 2018, though, the FDA made the decision to postpone that deadline until 2022. The postponement of that deadline may have given some companies in the vape industry the false impression that they can go right back to doing business as they did before 2016. That impression is wrong, and if your company isn’t in full compliance with the law, the FDA is preparing to crack down on you. If your vape shop is still doing business as it was before 2016, let this article serve as your wake-up call. Aside from the delayed deadline for submitting PMTA applications, every other provision of the Family Smoking Prevention and Tobacco Control Act now applies to you – and the FDA is conducting random checks to confirm compliance. The checks are unannounced, and you won’t know that your business failed an inspection until you receive a warning letter in the mail after the fact. Now is the time to make sure that you understand the laws applying to the ENDS industry and that your employees are fully trained and ready to act appropriately even when you aren’t there. We’re here to help! 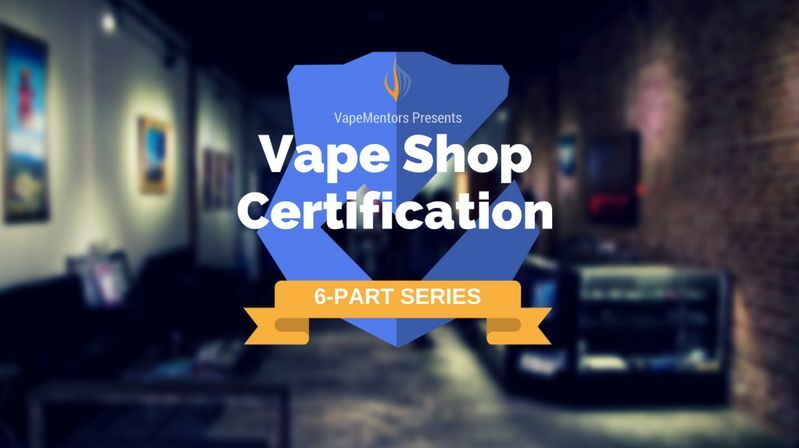 Click this link to download our FREE set of quick reference guides for vape shop compliance. Most commonly, the FDA will inspect vape shop by having a minor enter the store and attempt to buy an vape product. If the minor obtains the product successfully, you’ll receive a warning letter in the mail and must reply to the letter within 15 business days. When you reply to the letter, you must describe what your business is doing to ensure that no further sales to minors take place. If you have an employee training program in place, the FDA has stated that they will be more lenient on you and your business. The FDA generally doesn’t fine vape shops for the first violation of this rule found during an inspection. If you’re found in violation again, though, monetary fines will start to pile up. If the FDA discovers five or more violations within a three-year period, you may receive an order forbidding you from selling ENDS and other nicotine products. Don’t forget that an FDA inspection can happen when you’re not in the store. You must take the time to train your employees about the importance of complying with the laws that govern the vape industry. Document your training sessions carefully. If the FDA discovers a violation when inspecting your shop, your ability to provide evidence of an employee training program may result in a reduction of any civil penalties that you must pay. Have you been inspected but didn’t even realize it?? Search for your shop at this link to find out whether the FDA has already conducted an inspection of your store. Note that a recent inspection is not an indication that another inspector won’t visit your store again soon. If an FDA representative inspects your vape shop for correct labeling and advertising practices, you may receive notice when the inspector enters your facility. The inspector will introduce himself or herself, take down the name of the person in charge of the store at that time and provide a form indicating that a compliance check is taking place. Note that if your vape shop sells tobacco products, the FDA inspector will also check to ensure that you’re in compliance with all laws relating to those products. Don’t be an “accidental” manufacturer! Click this link to download our FREE set of quick reference guides for vape shop compliance. When inspections of ENDS manufacturers begin, the ramifications for the industry will be enormous. Some companies will face crushing fines because ENDS manufacturers across the country have completely ignored the most important aspect of the FDA’s deeming regulations of 2016. Those regulations froze the ENDS market on August 8, 2016. To legally market any new ENDS product after that date, you must submit a PMTA and receive a marketing order from the FDA. No company in the ENDS industry has submitted a PMTA yet – let alone had one approved by the FDA – and yet, new devices, tanks and liquids appear seemingly every day. The FDA will likely look to make examples of some companies marketing new ENDS products without approval. If your company manufactures ENDS products, it would be very wise to establish paper trails showing that your products were available to buy before August 8, 2016. What Else Will FDA Inspections of ENDS Manufacturers Entail? Marketing new products without approval is the biggest violation that FDA inspectors will attempt to catch when investigating ENDS product manufacturers, but it isn’t the only one. To ensure that you’re in full compliance, you must also do the following. Place prominent warnings on all products containing nicotine or that people are likely to use with nicotine. Register your company, products, packaging and advertising materials with the FDA. Your initial registration was due on October 12, 2017. Your updated product listing was due on June 30, 2018, and your full yearly registration is due on December 31, 2018. Submit the ingredients of your liquids to the FDA. If your company earns $5 million in revenue yearly or employs 150 or more full-time workers, the FDA considers you a major ENDS product manufacturer. Your ingredient listings were due on May 8, 2018. If you earn less than $5 million yearly and employ less than 150 workers, you are a small-scale ENDS product manufacturer. Your ingredient listings are due on November 8, 2018. If your company has missed any of the above deadlines, don’t wait – do whatever is necessary to get into compliance before FDA inspections begin.